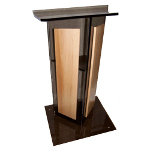 Acrylic Wood Floor Lectern shown here with Cherry Mahogany wooden panels. 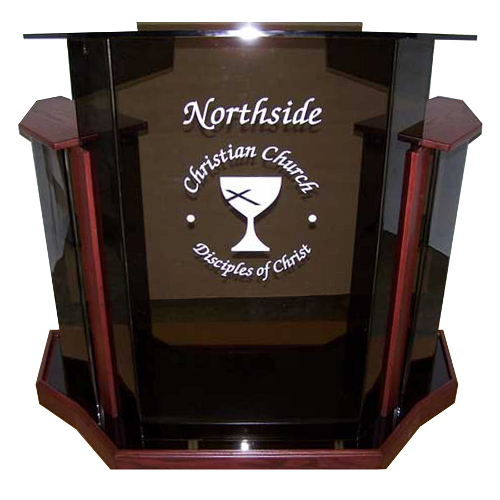 The SN3555 Series is a truly beautiful acrylic wing lectern with wood accents will add a contemporary style to any sanctuary. Reading surface has a 1 ½" lip to help keep papers in place. Wood panels and base are made from red oak with choice of 3 colors: Oak, Walnut, or Mahogany. Custom etched or vinyl logos available at an additional cost. Reading Surface Dimensions: 42" W x 24" D.